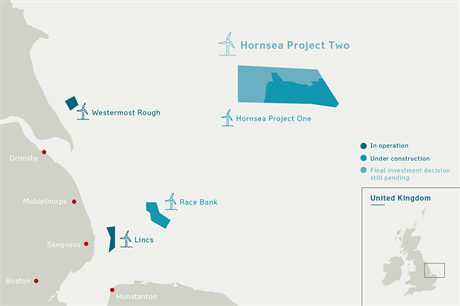 UK: The UK government has given its approval to Dong Energy's 1.8GW Hornsea Project Two site -- set to become the world's largest offshore project. Up to 300 turbines could be installed at the project site, off the coast of north-east England. The project will be located next to the 1.2GW Hornsea Project One, 89 kilometres off the UK's east coast. Project One was the previously largest consented offshore project, and reached a final investment decision in February. It will use 171 Siemens 7MW turbines. It is the first offshore wind project approval for new energy minister Greg Clark. "The UK's offshore wind industry has grown at an extraordinary rate over the last few years and is a fundamental part of our plans to build a clean, affordable, secure energy system," Clark said. The government said if fully developed, Hornsea Project Two could result in £6 billion (€7 billion) of investment. Dong was part of the Smart Wind consortium, including Mainstream Renewable Power and Siemens Financial Services, which developed the whole Hornsea Zone. Dong acquired the project from its partners in August 2015. The Hornsea Zone also has the proposed 2.4GW Hornsea Project 3 and 1GW Hornsea Project Four in development. RenewableUK's chief executive Hugh McNeal said: "Today's announcement is the latest vote of confidence in the UK's world-beating offshore wind market. This huge infrastructure project will provide much-needed investment and energy security for our country."